With multiple independent plates our Thermal Vacuum Chambers and be built and designed to produce temperatures in the range of -320F/-196C to +300F/150C. Multi-plate thermal vacuum systems can be customized to fit customer specifications, testing requirements, and budget. These systems also offer reliable and accurate temperature control. 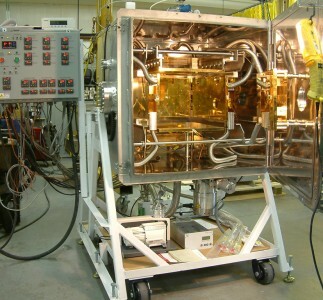 A thermal vacuum chamber shown with 3 Copper Thermal Plate with 2″x 2″ matrix with 1/4″ x 20 threaded holes, and with optional electronic ports, TC type K feedthrus, lights, cart, pump, filters/traps and windows. 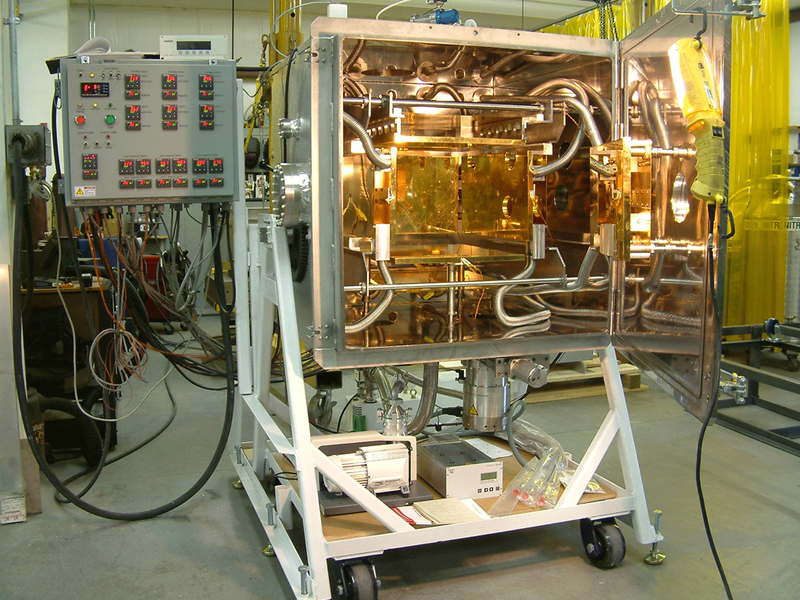 This thermal vacuum chamber is shown with 3 Copper Thermal Plate with 2″x 2″ matrix with 1/4″ x 20 threaded holes, and with optional electronic ports, TC type K feedthrus, lights, cart, pump, filters/traps and windows. Optional: Gold plated copper or aluminum plates offer better thermal connections, corrosion resistance and improved thermal life performance. These multi-plate thermal vacuum chambers are designed to be rugged units for product testing or production. Some of our customers find this to be a practical size for use in vacuum testing and degassing of parts, electronics, space simulation, and altitude testing. These chambers are also used in many other industries where vacuum work is required. It is constructed of welded aluminum alloy or stainless steel. Custom finish and dimensions are also an option. The door seal is a 3/16″ thick customer replaceable O-ring seal to withstand repeated closings. Two draw latches close the front door with stainless steel hinges. 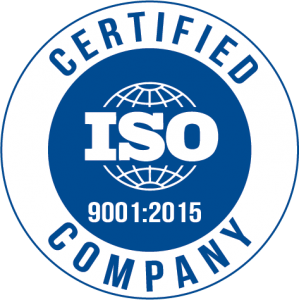 All chambers are vacuum tested to 29.92 inches of Hg or better (10-8 torr CERTIFICATE OF CONFORMANCE-optional) and should maintain this for its life depending on seal condition, ports, and customer use.